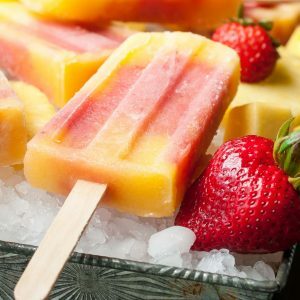 Beat the heat with these healthy all-natural Tropical Mango Fruit Pops swirled with mango, pineapple, and strawberries! They're kid and adult approved! Combine mango, pineapple, 1/4 cup almond milk, and 2 TBSP orange juice in you blender and blend until pureed. Set mixture aside by pouring into in a measuring cup with a pourable spout, if you have one. Next add strawberry and banana (or 2-3 extra ounces of your fruit of choice) to the blender with 1/2 cup almond milk and 2 TBSP orange juice and blend. Pulse in honey at the end and set aside. Using about half the mango-pineapple mixture, pour a little into each pop mold. Top with your strawberry layer then repeat with the remaining mango mixture. Insert a pop stick into each mixture and swirl together. You can also pop the mold into the freezer between each layer for a pretty striped pop. I go the easy swirl-y route, haha! EASY REMOVAL TIP: To remove pops from even the most stubborn sticky situation, fill an extra large bowl with water and lightly dip your pop mold into the water, steering clear of the top so you don't submerge it. Pops will come out clean and easy and can go through a "second freeze" (see storage tip below) to make them extra firm and less likely to melt all over you. This recipe is for a standard 10-pop mold. I picked up this one on sale from Amazon and adore it! See tips in post for perfect pops, every time! I use a combination of fresh and frozen fruit since that's what we typically keep on hand. Feel free to use all fresh or all frozen, just make sure you adjust the liquid ratio up for frozen and down for fresh, easy peasy!